I wanna be me when I grow up. 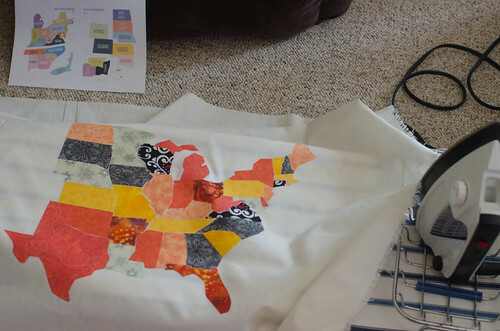 : My Fabric Map...the Pinterest Challenge!!! I was so excited to see Sherry at Young House Love and Katie at Bower Power announce it was yet again time for the Pinterest Challenge. I had two ideas in mind. I was going to turn the wine cabinet I'd bought a few weeks back into a brightly colored pen holder in my studio. However, I'm still not sure what color the room is going to be so I thought overbrightening the wine rack now might be a bit premature. 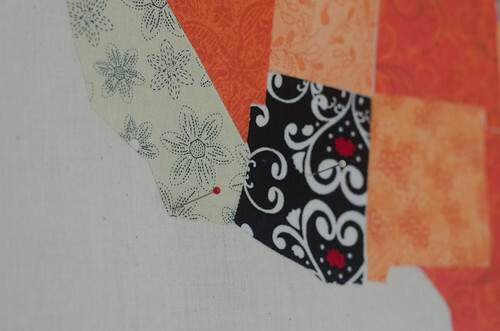 So, I went with option number 2 - a fabric map, inspired by this pin which is from a blog post by Being Brook. 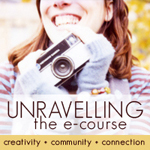 in her Creative Lifts newsletter this past week. 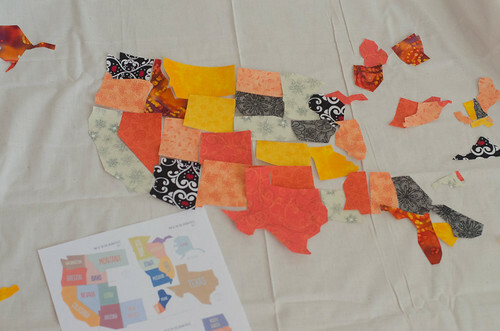 The map was the only thing on the list of supplies I needed to be able to do this project so now that I had this alternative - I was ready to go. I wanted to do this project as a way to track my goal of spending at least one night in all 50 states before my fiftieth birthday. I also think it will just be a fun piece to act as a centerpiece to a visual travelogue wall in my loft/office. Let's dig into how easy it was. I started by printing the PDF of the map puzzle and cutting out all the pieces. (If I did it over again, I'd print them onto card stock so they were a little more durable). I didn't cut out Hawaii from what was provided...I'll dig into why a bit later. I love that these pieces are a little "edgy" - they aren't true to a road map type shape with all the little wiggles and curves that make up a true map. This looks a bit more modern as all the lines are much more straight on this printable. It was that styling that made me decide this was the right map for me. The size of it was also perfect as I had a 24" x 24" board I wanted to use and this fit just perfectly side to side. After cutting out all the pieces, I grabbed the rest of my supplies. 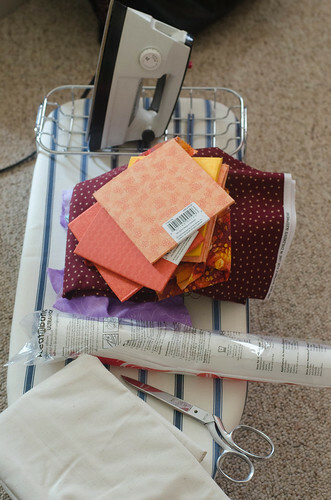 You'll need fabric scraps, some fusible heat bond interfacing, scissors, and an iron and ironing board. You're also going to need some sort of background fabric to mount it on. 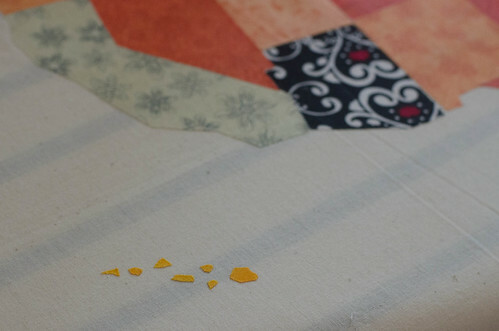 Instead of using 50 different scraps, I only used 10 different ones - and tended towards oranges, yellows, and some black/white for a little dark/contrast. My mounting fabric is just $1.99 a yard muslin that I keep on hand all the time for all sorts of crafty projects. 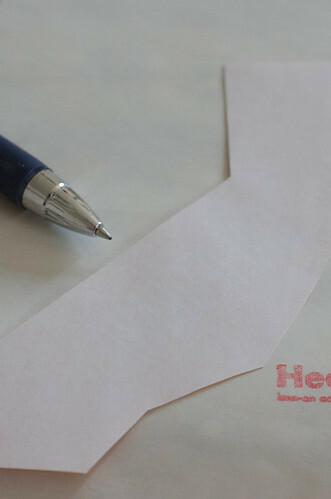 First, iron the heat bond onto the wrong side of your fabric scraps. 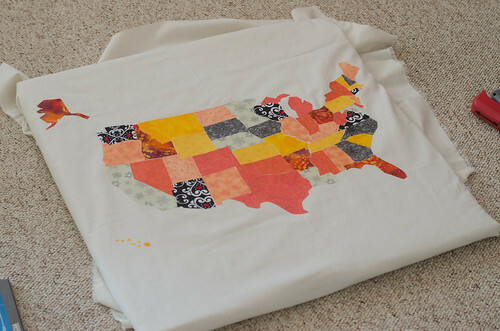 Since I was doing five states per fabric, I just put about a six inch square piece of bond onto the back of each fabric and then picked five states that felt as though they were nowhere close to each other on the map and traced them, face down, onto backing paper. Now...cut them all out ...again. Cutting was NEVER my favorite thing so this project did try my patience a bit. But, at least I was working mostly with straight lines and wasn't dealing with all the tiny little curves that would have been on it if I'd used real map pieces. 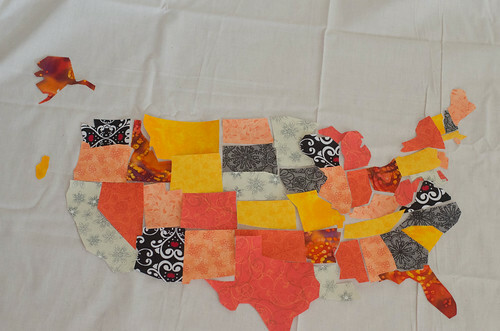 As I cut the pieces out, I test fit them - using a print out of the pieces as a master to make sure I didn't accidentally switch the places of Wyoming and Colorado or New Hampshire and Vermont. Given my general sense of direction and lack of geographical prowess...that - and much worse - was a distinct possiblity. When everything was cut out (still with the exception of Hawaii - right now it's that little yellow thing just hanging out west of Oregon right now - don't worry - I'll fix it here in a bit) it was time to peel off the backing paper on the fusible heat bond interfacing and iron it to the muslin. As you can see, my muslin needed a little love from the iron before I got to that so I knocked that out and then started fitting everything together with the iron. Just like in Brook's map, I started with Iowa since it's roughly in the center and it was pretty easy to build out from both sides. My pieces don't fit perfectly together - there are a few gaps and a few overlaps, but generally, it went together well. I think if I had used cardstock rather than plain paper for the original template, my lines would have been a little crisper so some of this might have been a little cleaner, but it wasn't enough to worry me or force me to recut anything. The tiny gaps tell you it's handmade and I'm okay with that. Speaking of not recutting anything, you might be saying...Kara did you not realize that Oklahoma and Texas are right next to each other? If you look closely - you will see those are two different fabrics. 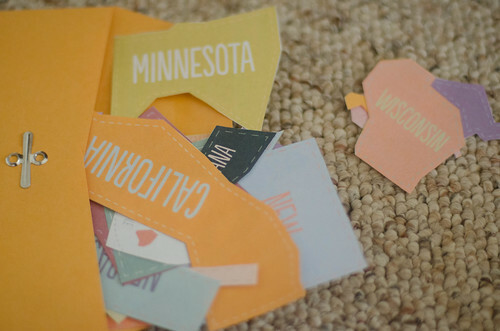 However, South Dakota and Iowa are the same fabric and do touch each other and Minnesota and Nebraska are pretty close. That said, I was going for "random" and in true randomness, I would have most likely ended up with more than what I have here next to each other in the exact same fabric. The mathematician in me could live with not fixing it and, from a design standpoint, I actually liked the balance of it overall. I left everything as it was and opted not to recut anything in a different fabric. 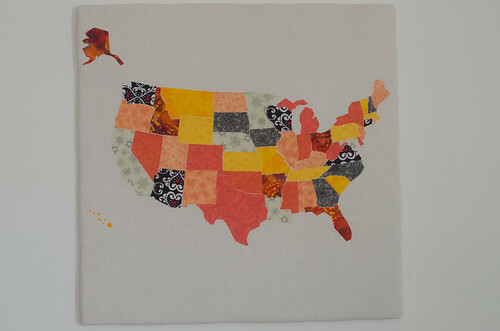 I also gave about 10 seconds consideration to stitching around each state but decided that was more trouble than I wanted and I didn't think it would add to the look. I also thought about adding in the Great lakes in some way, but again, decided it would just be a mass of blue up there so didn't worry about that either. Once the 48 contiguous states were attached, it was time to deal with where to put Alaska and Hawaii. I didn't mind that the printable I used didn't have these to scale. Alaska would have been enormous if it had been to scale. 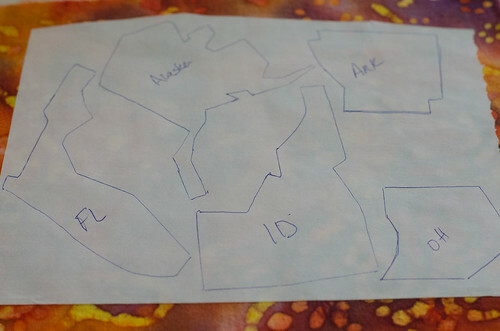 I did, however, mind that the printable only had four little islands for Hawaii. There are seven inhabited islands in Hawaii - and I've been fortunate enough to have visited three of them - so getting that a little more right was important to me. I don't know that I got shapes right, but it was a better effort than the four little pieces included in the printable. Now that everything is cut out and ironed down, it's time to mount or frame this. I decided to mount it over cork and a little fabric batting - just to give it a little more density since the muslin is so thin. 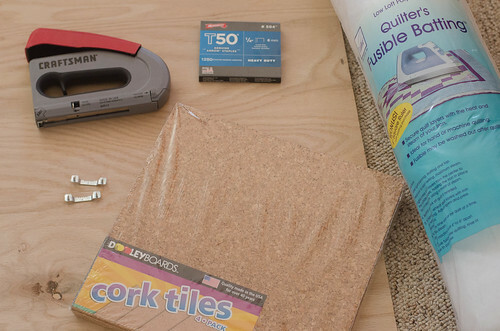 I already had the 24" x 24" project board and the pack of four cork tiles as well as the batting and my trusty staple gun. After digging for a couple of minutes in my tool box I also found a couple of "self leveling" project hangers that I could use to put this up on the wall, so now I just needed to "upholster" the project board. This is what it looked like just before I dropped about fifty staples all around the back side. The process for this is pretty straightforward - but a little time consuming. All told, it probably took me about four solid hours of work (although that was spread over a couple of days and certainly wasn't done in one large block). A large majority of it is just cutting so you can do that while watching tv, listening to music, etc. I had everything I needed for the project in my stash of crafty supplies so this was a $0 new dollar project for me. If you did have buy everything I'm guessing it would be around $25 - $40 plus fabric scraps. You'll have plenty of heat bond and batting left over to use on other projects. I didn't frame mine, like Brook did - although I may still add a frame later. 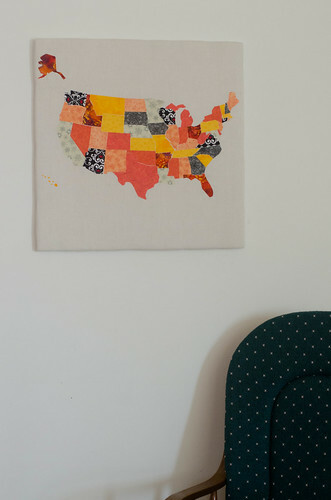 At the moment, I'm debating whether or not to add pins in each place where I've stayed or to just use this as the centerpiece and add framed photos around it of different places I've been....what do you think? Love this! I would have never figured out how to do something like this on my own! Crystal - I don't think I would have either. So glad someone else had figured it out before me. Thank you Courtney. I'm thrilled with how it turned out. I pinned the jigsaw puzzle too! Love you're execution of the project! Kristin - thanks. If you make one, please let me know. I'd love to see how it turns out! Oh I love it!! You did a wonderful job and using the jigsaw puzzle printable was genius!! I used a roadmap and it was such a pain to cut out. Great job!